We all get butterflies at some point in our lives, but when fear of social interaction threatens to take over your life, it is time to seek help. Suzanne, an intelligent woman in her thirties, had been lonely for much of her life. She had been stuck in the same secretarial job because she was afraid of working with people above her job level. She wanted to meet a man, but was sure she would say something stupid and be rejected. Her few good friends could not get her to go to restaurants or even parties because she was afraid other people might think she was a sloppy eater. The few times she agreed to go, her heart was pounding and she began to blush and perspire. When her primary care doctor finally referred her to a psychologist with experience in anxiety disorders, she was relieved to discover she had a treatable condition with a name—social phobia. Many people get nervous in certain social or business situations. There is nothing unusual about feeling anxious before making a presentation, going out on a first date, going to a party where you do not know many people, or having dinner with the boss. What is different about social phobia, also known as social anxiety disorder, is that you have an extreme fear of being judged by other people and acting in ways that might embarrass or humiliate you. You are also afraid of becoming the center of attention and worry that everyone is looking at you. As a result, you go to great lengths to avoid the social situations you fear. If you find yourself in one of these situations, such as a party, you experience intense anxiety that is out of proportion to the event. Social phobia usually begins in adolescence, although symptoms like extreme shyness may occur in earlier years. The disorder is chronic, although stress may cause the intensity to fluctuate. How Does It Differ From Shyness? Although social phobia responds readily to treatment, many people remain undiagnosed or misdiagnosed, in part because many people who suffer from social phobia are embarrassed to admit it. In addition, many clinicians do not know how to recognize social phobia and provide appropriate treatment. Because a large number of people with social phobia also suffer from depression or alcohol or drug problems, diagnosis and treatment can become more complicated. What Are the Two Types? Some people are afraid of a specific situation, often involving public speaking or performing. This severe stage fright may dampen the career of a musician, actor, or salesperson. Other people have generalized social phobia, which is a fear of several, if not most, social situations. In both types of social phobia, anxiety before, during, and after events and avoidance of feared situations significantly interfere with everyday life. However, generalized social phobia usually has more serious effects because it occurs in a number of different situations. You also fear that others will judge you negatively for having these symptoms, which further fuels the symptoms. What Are the Common Feared Situations? The exact cause of social phobia has not yet been identified. However, researchers believe it is a combination of biological and environmental factors. Some people may be genetically predisposed to social phobia. When they experience negative social interactions or a particularly stressful event, the disorder may be set off or exacerbated. Many people treated for social phobia experience significant improvement and are able to get the disorder under control. In addition, they are gradually exposed to feared situations. After repeated exposures and practice coping with the anxiety, they begin to realize that there is no need to feel embarrassed and that they can succeed at the task at hand. As more positive experiences occur with less anxiety, they feel less need to avoid previously feared situations. Relaxation training also can help in coping with the anxiety. CBT may have the greatest impact on the treatment of social phobia when it is done in a group because the main feature of the disorder is anxiety triggered by interactions with other people. Training in social skills is a useful adjunct to CBT, as is learning new ways of acting in different situations. For some people, medicine is helpful when taken alone or in combination with CBT. Different medicines work for different people. People with a specific social phobia may benefit from taking a beta blocker only before specific performances. However, people with generalized social phobia usually require medicine on a regular basis. Antidepressants, such as selective serotonin reuptake inhibitors (SSRIs) may be helpful in people with generalized social phobia. Dr. Hofmann encourages people who think they may have social phobia to seek treatment. Suzanne is a good example of someone who benefited from treatment. Within several months of starting treatment, she began to feel more confident in new social situations. A year later, she has a boyfriend and has just accepted a job promotion. She still gets anxious in some situations, but not enough to keep her from doing the things she wants to do. If you think you or someone you know may have social phobia, seek help from a mental health professional who has experience treating this disorder. You can get help to overcome your fears, feel more comfortable interacting with other people, and lead a fulfilling life. DynaMed Editorial Team. Social anxiety disorder. EBSCO DynaMed website. Hope D, Heimberg R, Juster H, et al. 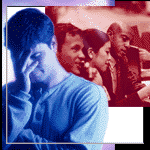 Managing Social Anxiety: A Cognitive-Behavioral Therapy Approach . The Psychological Corporation; 1999. Rapee R. Overcoming Shyness and Social Phobia: A Step-by-Step Guide . North Vale, NJ: Jason Aronson Inc; 1998.